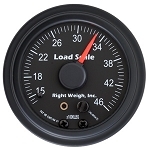 The 510-46B-KIT is a 2" gauge for interior mounting with values to 46,000 lbs. It features a black bezel and is back-lite with your choice of 7 LED colors. Our interior load scales offer reliable on-the-ground axle weight measurement of your tractor's drives and/or your trailer's axles from inside the cab of the tractor. 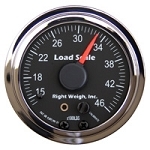 Dash mountable with clear analog readings displayed on our standard 2" gauge with chrome bezel and back light. Easy to install, our interior models can directly replace most existing air suspension PSI gauges, or stand alone using our simple installation kit, 101SK. Kit includes fittings, 30 feet of air line and calibration instructions. The 510 was designed for tandem axle air suspensions using a single leveling valve. 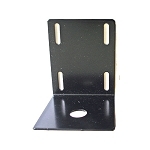 Black Bezel 7 LED color Backlight is available, see other products.